Measures of Success was created to ignite musical curiosity, unite conceptual knowledge with performance skills, foster understanding of the many ways people share and interact with music and assess each student's continued musical growth. While there are many differing opinions on starting systems, directors agree that the music itself is the most important component of a method. Creative titles stimulate the imagination, musicianship challenges promote expressive playing, and special attention is paid to important concepts such as phrasing. 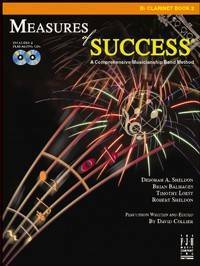 Students will enjoy the full band arrangements and directors will discover that this performance-based method also introduces students to critical listening, composing, conducting, music history and other elements that bring about a deeper understanding of music.